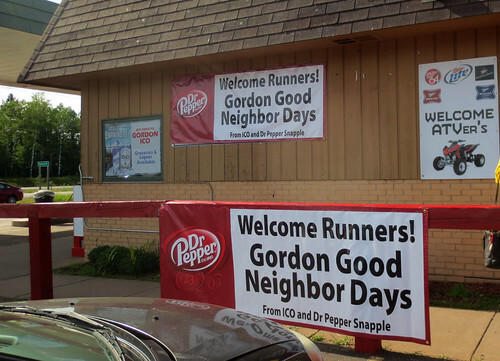 We are approaching Independence Day once again and that means it is time for Good Neighbor Days in Gordon, Wisconsin. 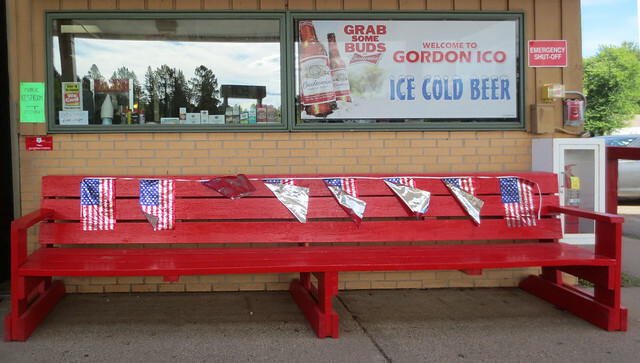 Some towns have a parade, some have fireworks, but Gordon goes "all in" to celebrate our independence from the British. And why not. Gordon has strong French roots. With a population not much more than 600, there is not a lot of town to see. The center of town is dominated by the ICO convenience store and gas station (usually the lowest priced gas for many miles.) Here's the sign set up across County Y to alert passersby to the coming celebration. That is our town constable, George Boothe, in our police cruiser keeping an eye on the traffic. The ICO store becomes a bit of a billboard at this time of year. There has been quite a bit of fresh paint applied around town too. Back up the highway toward the bait shop, there is a thriving antique store. 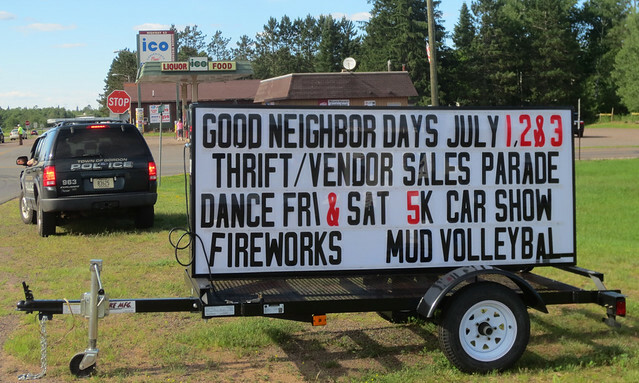 They have added a sideline of fireworks for their customers, many of whom may smuggle the minor explosives back into straight-laced Minnesota where nothing much beyond a sparkler is permitted. Gordon has seen a decline over the years from its historic role as a fur trading post, then timber town, then rail junction and one result is a few abandoned buildings. 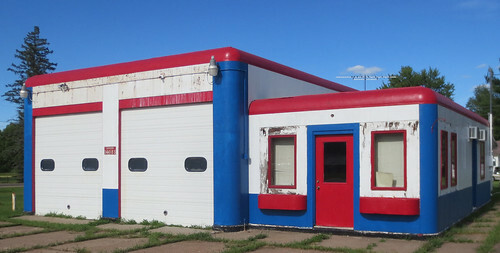 In particular, a long abandoned service station along highway 53 offers potential to the right entrepreneur but has stood as a bit of an eyesore until it received some fresh paint this year. Not quite finished, it offers a fresh look for Good Neighbor Days of 2016.